In 10-inch skillet, heat 3 tablespoons of the oil over medium heat. Add 3/4 cup onions; cook 2 to 3 minutes, stirring frequently, or until onions are softened. Add chicken, curry powder, garlic powder, and 1/4 teaspoon of the cayenne pepper; cook 2 minutes, stirring constantly. Stir in pineapple juice, crushed pineapple, raisins, coconut and pickles. Bring to a boil. Reduce heat to medium-low; simmer uncovered 7 to 10 minutes, stirring occasionally, or until liquid is absorbed. Remove from heat. Heat oven to 350°F. Unroll both cans of crescent dough; separate dough into 8 rectangles. Firmly press perforations to seal. Press each piece of dough into 7x3 1/2-inch rectangle. Cut each rectangle crosswise into 2 squares. Place about 2 tablespoons of chicken mixture onto center of each square; fold dough in half diagonally to form a triangle. With fork, seal edges. Place 2 inches apart on ungreased cookie sheet. Bake 11 to 15 minutes or until light golden brown. Meanwhile, in 1-quart saucepan, combine peanut butter, remaining 5 tablespoons oil, soy sauce, sugar, vinegar, remaining 1/4 teaspoon cayenne pepper, and green onion. Cook over medium heat, stirring constantly with wire whisk, or until thoroughly heated. To serve, place 2 turnovers on each of 8 plates. 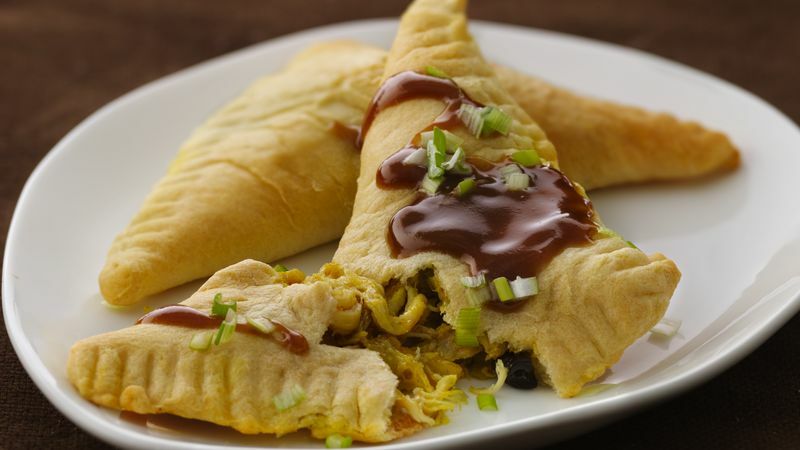 Drizzle each turnover with 1 teaspoon of the sauce. Serve with remaining sauce. Sprinkle turnovers with additional chopped green onion, if desired.